Paul Fields represents domestic and international insurers, leading Fields Howell’s first-party property team as a respected attorney with thirty years of experience. In addition to leading the first-party property team, Paul does significant work in the areas of casualty, professional indemnity, and aviation. 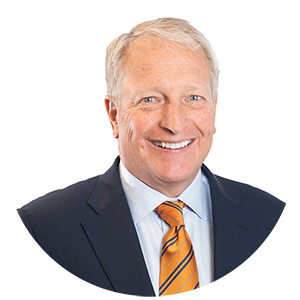 Over the years, Paul has tried over thirty jury trials, handling extensive and complicated bench trials and arbitrations. In recent years, Paul has been lead counsel in three successful multi-million dollar class-action lawsuits. Committed to his clients, he argued before appellate courts and had them reverse trial court decisions on several occasions, and he continues to handle various complicated matters. Time and again, Paul has been elected by his peers for various awards and recognition. In 2018, Paul earned an AV rating from Martindale-Hubbell® for his high level of professional excellence and outstanding ethics. He has also been ranked among the top 5% of lawyers in Georgia by Super Lawyers® for the last eight consecutive years. In 2016, Paul won the Client Choice Award, presented by the International Law Office and Lexology, in the insurance category. He continues to provide the highest level of client service and legal representation to all of his clients. Currently, Paul serves as counsel to a group dealing with property and casualty insurance issues in the London insurance market. He received his Juris Doctor from the University of Georgia in 1988. Successfully defended a class action alleging the Syndicates in the Lloyd’s of London Insurance Market were not approved surplus lines insurers. Represented the London Insurance Market in early and successful resolution of class action complaint relating to depreciation of labor in Arkansas. Achieved early resolution of class action alleging improprieties in forced-placed insurance coverage. Obtained summary judgment in favor of carrier in suit alleging hail damage. Lead counsel in arbitration against large national retailer seeking over $40 million arising out of alleged Hurricane Katrina damage. Lead counsel for reinsurers of state insurance fund in $40 million arbitration against state parks commission for damages from Hurricane Ivan. Obtaining summary judgment and argued before the United States Court of Appeals for the Fourth Circuit, which affirmed a judgment for an insurer, in a large fire loss. Defending insurers against a nationwide grocery chain’s claim for its multi-location Hurricane Katrina losses. Advising various insurers on a $300 million factory explosion claim, which included property and time element coverage claims. Counseling insurers regarding the handling of a $20 million business interruption claim caused by failed efforts to repair a sulfuric acid plant.